Back in the recording studio after more than 20 years, singer-songwriter Anne Lewis has defied the odds to record a fine new album, Expressions. In addition to living with Stargardt disease, a hereditary retinal disorder that left her legally blind, the retired public servant has survived two bouts with cancer. 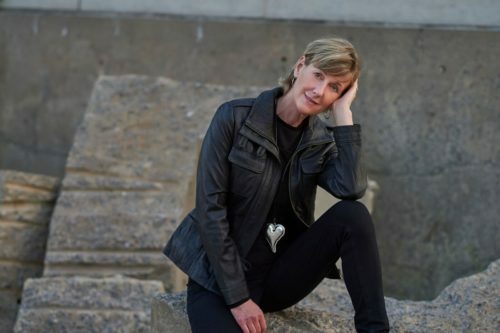 It took years to regain the lustrous tone of her singing voice, Lynn Saxberg found out while speaking to Lewis about her journey. Q: It’s been a couple of decades since you recorded a CD. Why now? Q: Where did the songs come from? A: One is from my first record in ’93, and one is from subsequent record in ’95, and the rest are all songs that I wrote last year. I was going through many different twists and turns of my life, and wrote these songs about all of the people and events that were touching my life last year. Q: It’s jazzier than your previous recordings. How come? A: I’ve been singing around town, primarily jazz classics and a lot of the jazz standards, for the last four years. And I’ve developed such a passion for them. So I wondered if I could do a jazz album, but not relinquish my very diverse style, my contemporary pop, my easy listening, all of those things. Q: What was your first step in making it happen? A: I contacted Mark Ferguson. He’s the go-to fellow for arrangements and is an amazing talent. I said to him: ‘I would love you to infuse my sound with that jazz genre without losing my me.’ I think my album really is a blending of different styles. I’m joined by some fantastic musicians, including Mike Rud on guitar, John Geggie on double bass and Jeff Asselin on drums. Q: You mentioned the twists and turns of last year. Was it a particularly eventful year? Q: What did you have to do to prepare your voice? A: I couldn’t sing for many, many years. I had a couple of different cancers in the same year, and one of the cancers compromised my vocal cords. So I couldn’t sing and I worked with a speech pathologist to help me bring it back, and it took a long time to regain it. And then when it did start to come back, there was the whole other self-confidence side of it. It was a big challenge. Not a bit of a challenge, a big challenge. A: Certainly 10 years, but it felt like more than that. I was diagnosed with both cancers in 2004, and I returned to singing in 2014. I had a stage 3 melanoma in August 2004, and then a thyroid cancer in December of that year so it was a tough year. But I’m back and I feel like my voice is better than ever. It’s like running a marathon. If you don’t train, if you don’t use your legs everyday, you can’t run. Same thing with singing. I have to sing every day, and I love it. Q: It must have been devastating for you to lose the ability to sing. A: It was. I sold my piano, and I couldn’t even go to a concert because it just killed me. It was really a difficult time in my life. So I just dug myself into work in the government, and carried on. Then my son and daughter-in-law approached me about singing at their wedding in 2008. Initially, I said I couldn’t. And then I thought maybe I could squeak something out. It would be a safe environment. So I did and it really helped boost my self-confidence. I worked even harder at bringing my voice back and regaining my full range so that was pivotal, for sure. Q: Are you a grandmother now? A: Yes, I have two beautiful granddaughters and one of the songs on the album, A Song for Abby, is written for Abby, my granddaughter, and I’ve written another one for Kate, but I didn’t put that one on the album. Abby is seven, Kate is five, and they’re coming to the NAC on Saturday. It’s so exciting for them. They’re allowed to stay up late for the concert. Q: There’s a lot of love on the CD. A: There is, because there’s a lot of love in my life. There’s a song for my mom. She’s in her sixth year of an Alzheimer diagnosis. Because of You is for my wonderful husband. We’ve been together now 23 years. There’s a a song for my girlfriend who’s been going through an unraveling of her relationship. And then About Me, it is about me. I think, last year, I was going through some sort of self-examination. I did a reach back into my life, and wrote that song about me. A: Unkind was triggered by a difficult experience that I had. I’m partially sighted, and I found myself in a situation needing to cross a street where there were no crosswalks or lights. I asked a man to help me and he said no, so I wrote that song about that. Q: Is this record the start of a comeback? A: No. I’m thinking about festivals, but I want to really be honest. I think at 60, it isn’t about a comeback. It’s just about the joy of being able to do this, and to listen to my songs, and hopefully have others enjoy them as well. I did this for me. Q: How’s your health these days? A: It’s great. I’m cancer-free, and fit and just living my life every day. I’m enjoying my grandchildren, and the lake, and just playing. I have a piano here and I’m pounding away every day. When: Saturday, Jan. 27, 7:30 p.m.